Workplace conflict is a natural part of our working experience and something that we can’t really avoid. It crops up in so many forms and varying intensity. 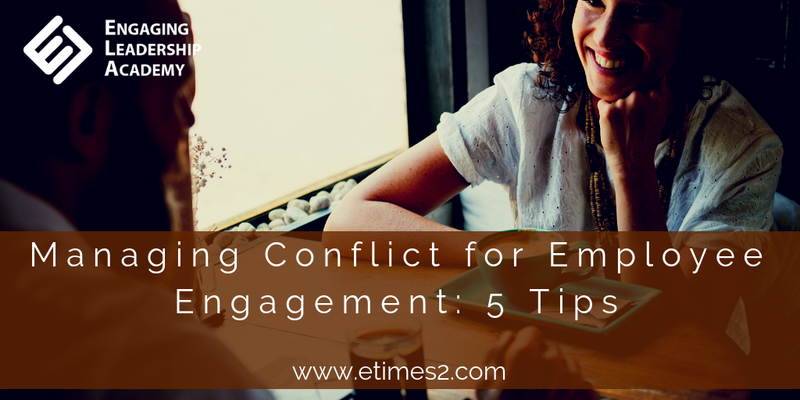 Workplace conflict is also a key factor in employee engagement. Or, more accurately, how it is managed is crucial to how your team members feel. 2. Stamp it out. People should just focus on doing what they are told. Like many of you reading this, I have seen both these approaches in my time as an employee. On many occasions, actually. Reflecting back through these occasions, I fail to identify one that didn’t end badly for all concerned. For example, I recall a team I worked in where there was one colleague who behaved both aggressively and maliciously towards the others. Collaborative work on a shared drive was frequently sabotaged (her name was on it as the last person to open it! ), team meetings were often taken over and prolonged, projects ground to a halt through deliberate stalling, and fellow team members were openly criticised. The manager moaned about this person’s behaviour to other team members, yet chose to ignore it otherwise. As this conflict escalated, the same manager then tried to stamp out the unrest through autocratic and dictatorial methods. She sat amongst the team to stop people talking about the crippling atmosphere in the team. On a couple of occasions, she actually instructed the team not to discuss the range of issues causing discontent. Team members were not allowed to challenge behaviours, actions or even how things were done. No improvements were welcome. The result? Obviously, these behaviours and responses to conflict had a devastating impact on the team. Eventually, almost the entire team at that point left to take up other jobs. Manage workplace conflict well and both you and your team will be real winners. Well managed conflict empowers employees to feel valued and able to make the workplace a great place to be. They feel that their intellect matters every bit as much as the work they carry out on a daily basis. You will be rewarded by employees who feel that they have space to be creative and innovative in how they do their job. They are much more likely to be engaged as a result of the positive atmosphere leading to stronger and more productive working relationships. They will see conflict as a positive, respectful process to make the workplace better by improving the quality, outputs and efficiencies of their work. 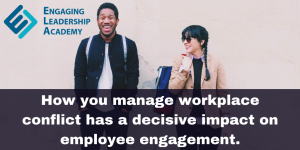 We all know the benefits of an engaged workforce. So, how can you manage conflict positively? Make space in your team meetings where team members can talk openly about the issues affecting their ability to deliver great work. What is holding them back? What is slowing down productivity? What constructive changes would they make to their job and how their work is carried out? Make this an item on the team meeting agenda. Make it safe. 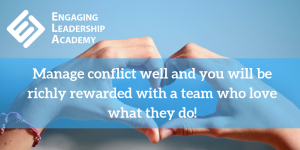 You are now telling your team that conflict is OK. What you do not want, however, is a team member misinterpreting this and taking aim at someone. So, discuss and explore the idea of using conflict in the team constructively to enable each person to bring their full value to the table, to make the team stronger. Define what conflict means and agree the process by which it can happen. Well managed conflict in the workplace provides such a rich learning opportunity. Include this in the discussions with your team. Talk about how constructive conflict can help everyone understand their jobs better, how they can identify and implement improvements and get the credit for their contributions. Regular followers of my blogs will realise that I keep harping on about challenging the status quo. It is so important because employees who feel they have a sense of control over their work are more likely to be more resilient and perceive conflict positively. Giving your team permission to challenge how work is done in pursuit of a better way also shares control of how work is done in your team. It builds ownership and a vested interest in finding solutions in the conflict situation. You don’t want to be like the manager in the example above. She believed that anything done ‘under her watch’ was sacrosanct and did not need to be improved. Ever. She had been in post over 20 years and reacted aggressively towards any suggested improvements. People stopped suggesting and withheld contributions because it was the safest thing to do. You need to think about how you react to any challenges to how work is done in your team. Your reactions are critical to a positive outcome. Your behaviour sets the tone and tells your team whether challenge, creativity and contribution is safe. Prepare yourself to deal with all suggestions with good grace. It will very worthwhile in the long run. Are you continually seeking new and better ways to create an engaging environment for your team? Yes? Then join my FREE LUNCH AND LEARN sessions – click here to take part. I look forward to helping you build a highly engaged team!! What Do Employees Want From Their Manager?